30th July 2018, New Delhi: Adulteration of food has been an issue that India has been battling with for decades now. From Mixing milk with water to add volume, starch in paneer to make it thicker and fluffier and hydrogenated oils in Vanaspati, everyone knows about the problem but choose to ignore it. Food colors, chemicals and additives are added not just in our local produce, but even in packaged food products making them dangerous for human consumption. 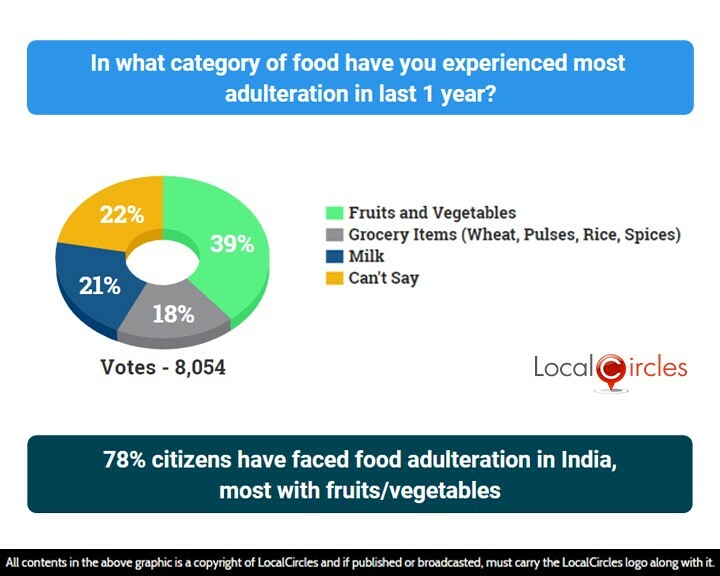 LocalCircles conducted a 4-point survey to ask the citizens where they faced issues and what should be done with the vendors/sellers who engage in food adulteration. In the first question, citizens were asked in what category have they experienced most adulteration in the last 1 year. 39% said fruits and vegetables and 18% said grocery items like wheat, pulses, rice, spices etc. 21% said milk while 22% were unsure. Use of Calcium Carbide and Ethylene gas to artificially ripen fruits is becoming rampant nowadays. These methods can have serious health consequences in the long run. The Government has been trying to stop this practice but has not been very successful so far. This technique is majorly used in the mango season to make the fruit ripen faster. According to citizens calcium carbide usage is still rampant for artificial ripening though some vendors in bigger cities are using Chinese ethylene sachets. 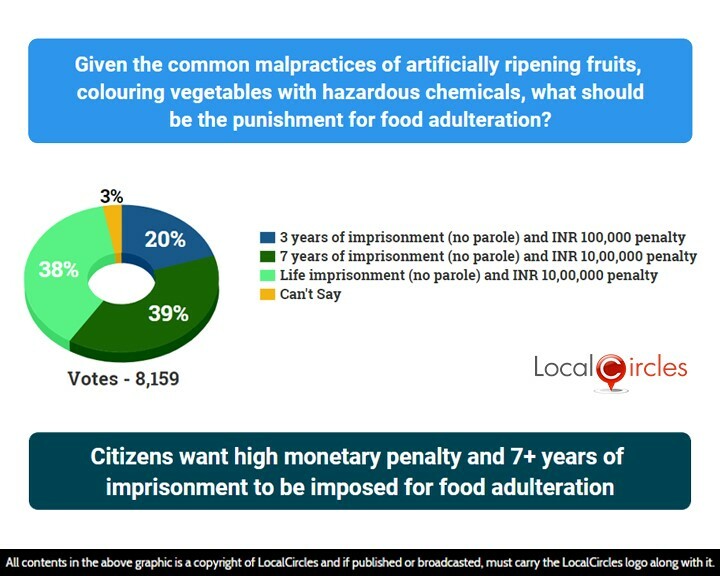 The second question asked if given the common malpractices of artificially ripening of fruits and coloring vegetables with hazardous chemicals should be considered as food adulteration and what should be the punishment for it. 20% said it should attract 3 years imprisonment without parole and Rs. 1 lakh penalty, 39% said 7 years imprisonment with Rs. 10 lakh penalty, while 38% said life imprisonment with Rs. 10 lakh penalty. 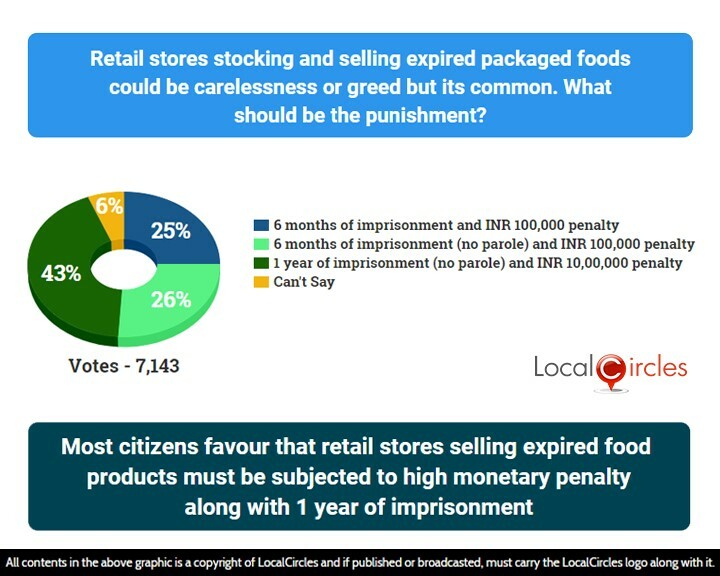 The third question asked what the punishment for should be selling expired packaged food products. 25% said 6 months imprisonment with Rs. 1 lakh penalty, 26% said 6 months imprisonment without parole and Rs. 1 lakh penalty, and 43% said 1-year imprisonment without parole and Rs. 10 lakh penalty. It is common to find expired packaged products from retail shops in the country, esp in tier 2, 3 and rural locations and the onus lies on the consumer to check the expiry date before buying. Many cases of ecommerce sites selling expired or close to expiry packaged food products have been reported too. 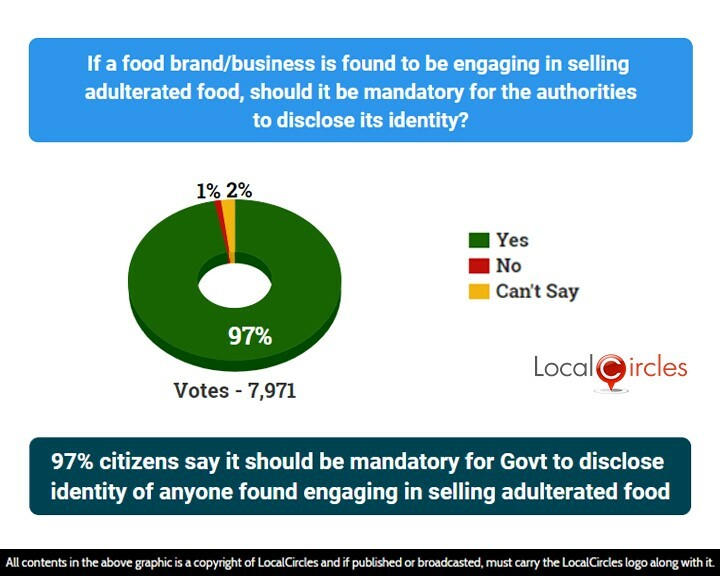 In the final question, 97% citizens said it should be mandatory for Government to disclose the identity of anyone found engaging in selling adulterated food. Only 1% were against it. As it stands, today when a restaurant or a business fails the food test, the test results and especially their identity is not made known to the public. According to citizens, awareness is key and FSSAI and state food departments must take active steps in ensuring the community knows about the businesses and brands that are non-compliant. 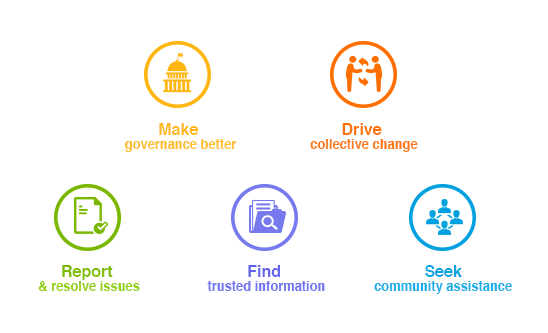 Over 30,000 responses were received from over 13,000 unique citizens located in 200+ districts of India. Approximately 35% of the respondents were women while 65% were men. 42% of the participants were from Metro/Tier 1 cities, 36% from Tier 2 cities and 22% were from Tier 3 and rural locations.